This common expression used to declare the obvious also serves to illustrate the visual prominence of that central facial feature. When there’s a problem with that feature, nasal surgery or rhinoplasty often presents the best solution. In the Atlanta area, patients seeking precision rhinoplasty look to Dr. Burke Robinson for his expertise as a surgeon who is double board certified in both facial plastics and otolaryngology (ENT). Leading Atlanta area facial plastic surgeon, Dr. Robinson has experience in reducing and increasing the overall size of the nose, changing the shape of the tip or bridge, changing the size of the nostrils, and altering the angle between the nose and the upper lip. Depending on the current state of your nose, however, certain changes may be easier to achieve through surgery than others. And, as a facial plastic surgeon board-certified in otolaryngology (the branch of medicine dealing with the ear, nose, and throat), Dr. Robinson is especially skilled at upholding the functionality of the nose during rhinoplasty. Because of his extensive training and experience in this surgery, it is not uncommon for other plastic surgeons in the Atlanta area to refer primary, as well as, revision rhinoplasties to Dr. Robinson for his care. While some surgeons who do not possess Dr. Robinson’s skill or certifications may ultimately sacrifice function for appearance, Dr. Robinson is able to create a nose that is both beautiful and functional. At your rhinoplasty consultation, Dr. Robinson can learn more about your aesthetic goals and inform you of what can and cannot be accomplished through nose surgery. In addition to educating his patients and answering any questions that they may have during the one-on-one consultation, Dr. Robinson employs a 3D imager to help illustrate your possible results and address your realistic outcomes for surgery. “Rhinoplasty is a very artistic procedure,” Dr. Robinson says. “No two noses are alike, so each surgery has its own nuances. It requires a very adept surgeon.” Patients receive a thorough clarification of the risks and rewards involved in a potential rhinoplasty, including an explanation of how the nasal structures, including bone and cartilage, can be sculpted to reshape the nose. And for those individuals that need it, he also educates on how augmentation of the chin can enhance the desired results. Some people come to Dr. Burke Robinson for cosmetic rhinoplasty while others come because they have functional breathing problems. Many have come to him because they are unsatisfied with their previous rhinoplasty performed by another surgeon. The latter scenario is corrected with revision rhinoplasty and often includes both functional and aesthetic corrections. Whether the surgery is desired for functional or cosmetic reasons, your choice of a qualified facial plastic surgeon is of paramount importance. Dr. Robinson is trained in facial plastic and reconstructive surgery; as well as, ear, nose, and throat surgery. This extensive education and training provide you with a superior level of expertise and experience. Rhinoplasty can address cosmetic concerns about the nose, or serve to correct functional breathing issues. Some patients may require rhinoplasty to improve the appearance of the size, tip, or slope of the nose or nostrils. However, patients with breathing problems often necessitate adjustments to the interior nasal septum. Whatever the reason, Dr. Robinson guides patients toward the best solutions for their specific concerns and focuses on achieving natural results. It is important for patients to consider that there is no such thing as a perfect nose – the right nose differs from patient to patient and depends entirely on what would look most natural. 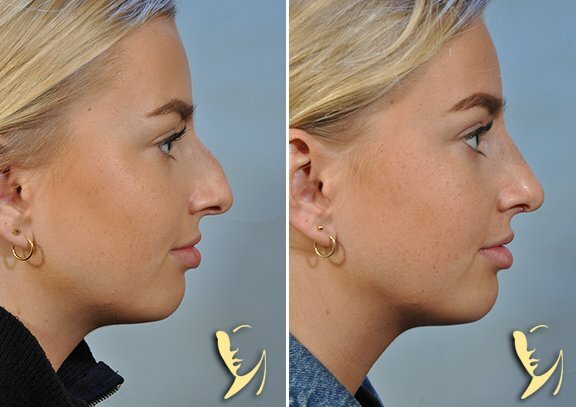 While improvements can be made to the nose’s size, tip, slope, and nostrils, in many situations a drastic change in the nose is neither surgically possible nor aesthetically desirable. There are two types of surgical approach to rhinoplasty— closed and open. In a closed procedure, the incisions are made within the nostrils and cartilage manipulated from the interior. In an open procedure, an incision is made across the vertical strip of tissue separating the nostrils allowing for the deeper access to nasal structures necessary during complex cases. The exact methods used in surgery differ depending upon the patient and will be discussed during the surgical consultation. Rhinoplasty is a delicate procedure that requires about a week or more of initial recovery time. Immediately after surgery, a splint is applied to the nose to help maintain support while the tissue heals. After a week, patients return to the office to for a follow-up appointment to check the recovery progress and have dressings removed. Most patients are then able to resume normal activity but must remain careful to avoid contact sports or wear glasses for six weeks post-surgery. “Of all plastic surgeries, a rhinoplasty is perhaps the most emotional of all facial plastic surgery procedure to go through,” according to Dr. Robinson, “because we are not changing something from the aging process, but rather something that has been present their whole life, of which they have been self-conscious.” Dr. Robinson adds, “It is also the most gratifying because it produces the biggest positive change. The nose is the center of attention – it’s what people notice right away about your face.” Most patients are extremely pleased with their results once the swelling has gone down. Dr. Robinson improved Dianna’s facial proportion with a rhinoplasty & chin implant, providing personalized attention and specialized care every step of the way. When Betsy came to Dr. Robinson for a rhinoplasty procedure, she immediately felt like family. Dr. Robinson explains why he prefers the open rhinoplasty technique which requires one tiny incision along the base of the nose. The decision to undergo rhinoplasty is a major one and can vastly improve the self-confidence of a person who has always been self-conscious about his or her nose. Therefore, it is understandable that patients have many questions about the procedure and are curious to know how they will look after having had the surgery. Dr. Burke Robinson can help provide information. He has performed the procedure for patients in Atlanta & nationwide and has mastered the art of nose surgery. His consistent and predictable results and expert surgical technique, as well as his status as one of the very few double board-certified surgeons in the area, have made him one of Atlanta’s top nose surgery doctors. At what age is rhinoplasty (nose surgery) usually performed? Nose surgery can be performed on an adult of any age, but it is most commonly performed on patients ages 18 to 30. By this time, many patients will have experienced schoolyard teasing because of their noses, but they will also have the perspective and maturity necessary to make decisions for themselves about whether to have rhinoplasty surgery. In select cases, younger teens may be operated on, but they must be past the adolescent growth spurt, possess the maturity to make such a decision, and be responsible enough to follow through with all pre- and postoperative instructions that Dr. Robinson provides. If I were to have surgery, would I have an open or closed rhinoplasty? Some minor aesthetic issues can be corrected with closed rhinoplasty surgery, but many more complex nose surgeries necessitate open rhinoplasty. The choice depends on the doctor – some surgeons favor the closed approach, as it results in less scarring, while others prefer the access to the open nose surgery technique. Dr. Robinson is experienced in both methods and prefers to make this decision on a patient-by-patient basis. A customized approach allows Dr. Robinson to formulate an individualized surgical plan based on the particular patient’s needs. To learn whether the open or closed approach will best suit your surgical goals, schedule a consultation with Dr. Burke Robinson. Why is chin augmentation sometimes recommended in combination with nose surgery? Angles of both the nose and chin work together to create facial balance. A weak chin may make a large nose appear larger simply because of facial proportions. By adding a small implant to the chin in a straightforward surgical procedure, a surgeon can greatly diminish the prominence of the nose. Viewing before-and-after photos of the procedure illustrates the surprisingly dramatic improvement that can be achieved by subtly enlarging the chin. If a chin implant would be beneficial, Dr. Robinson will inform you during your nose surgery consultation. What can I anticipate during recovery? For a week after the surgery, the patient must wear a splint to protect the nose and offer structural support during the healing process. Facial swelling may occur, as well as bruising and discomfort in the throat; pain medication can alleviate this discomfort, which should not last more than a few days after surgery. After a week, the patient visits Dr. Robinson again to have the dressings removed and are usually able to return to their normal routines with a few exceptions. Patients are advised not to wear glasses or participate in contact sports for six weeks post-surgery. What should I consider when choosing a rhinoplasty surgeon? People should be careful when choosing a doctor to perform nose surgery, advises Dr. Robinson. “Rhinoplasty is an evolved technique, referred to as the most difficult plastic surgery to do.” This difficulty arises because of the complex aesthetic issues involved – a good result for one patient may look unnatural or unappealing on another – as well as the importance of preserving the functionality of the nose. If you are interested in rhinoplasty surgery, seek a qualified and experienced doctor, preferably one with over 10 years of experience with rhinoplasty. Be careful, though: putting too much weight on years of experience might also be deceiving. If a surgeon performs only facial plastic surgery, he or she may actually have more experience with rhinoplasty than a plastic surgeon with more years in practice. Board-certified by both the American Board of Facial Plastic and Reconstructive Surgery and the American Board of Otolaryngology (ear, nose, and throat), Dr. Robinson is extensively qualified in both of these areas. He also has more than 25 years of experience in performing facial plastic surgery solely. In this time, Dr. Robinson has performed hundreds of nose surgeries, far more than the average plastic surgeon who performs facial plastic surgery in addition to breast and body procedures. Rhinoplasty is often considered to be the most difficult plastic surgery procedure to perform, which is why it is important to seek the finest care before entrusting your nose to a surgeon.